One of the most dramatic geographical characteristics of Central America is the natural disasters that periodically strike the region. Although the volcanic mountains that run from Guatemala through Panama are very scenic, they can also be devastating when they erupt. 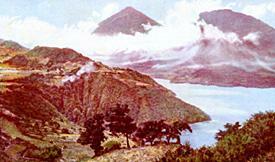 Historically, these volcanic eruptions have wreaked havoc on each of the Central American countries. Hurricanes and the resulting floods affect the lowlands. In December 1998, Hurricane Mitch devastated Central America, especially Honduras and Nicaragua, leaving thousands dead and even more homeless. Earthquakes, like the one in Managua, Nicaragua in 1972, are just one more natural disaster that affect the region periodically. The region contains some valuable natural resources, including nickel, iron ore, fish, timber and oil. Unfortunately, the digging and mining of some of these resources has created environmental problems. For example, mining in Honduras has led to water pollution. The logging of timber has led each of the six countries to unsustainable rates of deforestation. Panama has a unique geographic factor. Given its narrowness, Panama provided the most convenient place to build a path (the Panama Canal) between the Atlantic and Pacific Oceans. The Canal allows ships sailing from the Atlantic to the Pacific Ocean (or visa versa) to go through the Canal as a way to avoid going around South America. Sailing though the canal can save a great amount of time and money.